In Louisiana, the air was warm and moist in the spring. I would walk outside, barefoot and all, with a song on my lips and flowers in my hair. It was perfect weather for venturing out and exploring. I would walk along the garden and look at the dark green tomato leaves and the cucumber plants anticipating exploding with the warmer weather. And then, something caught my eye. I walked around the shed and hidden in my own secret garden was a bush of honeysuckles as big as a bear, just sitting there, waiting to be discovered. They were draped around each other, perfuming the air with the sweet smell of honey that would make even the most bitter of person smile in delight. And as any good Southern child knows, the experience only starts with the nose. Grabbing a branch, I carefully picked the blossoms off its resting place. I pinched off the end of the flower and gingerly pulled the stem away from the petals. And there, like a secret from a best friend, lies a drop of heaven that makes my eyes light up in joy. It’s there, waiting just for me to possess. It’s like a word of encouragement, a hug when you are in pain, or the smell of rain; there is nothing quite like tasting the nectar of a honeysuckle. 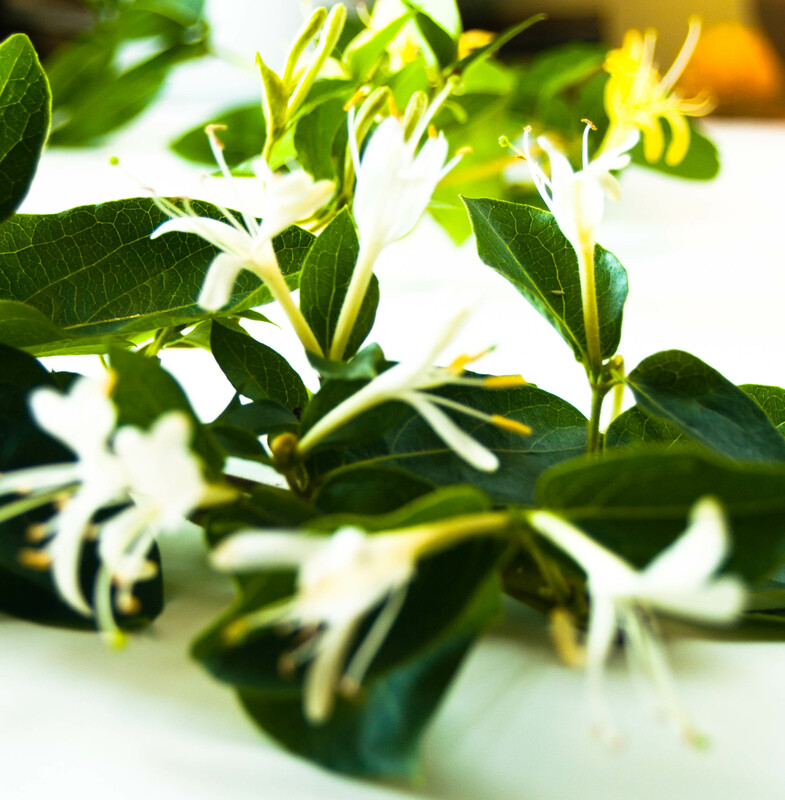 *Note: If you are allergic (or slightly allergic) to the pollen of honeysuckles, skip the actual honeysuckle blossoms of this recipe for 2 tablespoons of wildflower or orange blossom honey. The honey will give you the floral taste that the honeysuckles give. In a glass-measuring cup, heat water in microwave until boiling. Stir in the sugar until completely dissolved. Stir in the lemon juice and the honey. Stir to combine. Let cool slightly before adding the fresh blossoms (or go ahead and add the other honey if using). Let the blossoms steep for about 5-10 minutes. Strain the mixture and let cool in the refrigerator for 4-6 hours. Using an ice cream machine, freeze the sorbet mixture according to the machine’s instructions. Let the mixture completely freeze in the freezer for a few hours. Oh thank you so much! I love honeysuckle and wanted to make a floral dessert from my favorite summer flower!